April showers bring forth May flowers so the saying goes. Could they help you grow some money too? Casumo Casino certainly thinks so and will be awarding £40,000 throughout this month courtesy of its April Cash Showers giveaway. 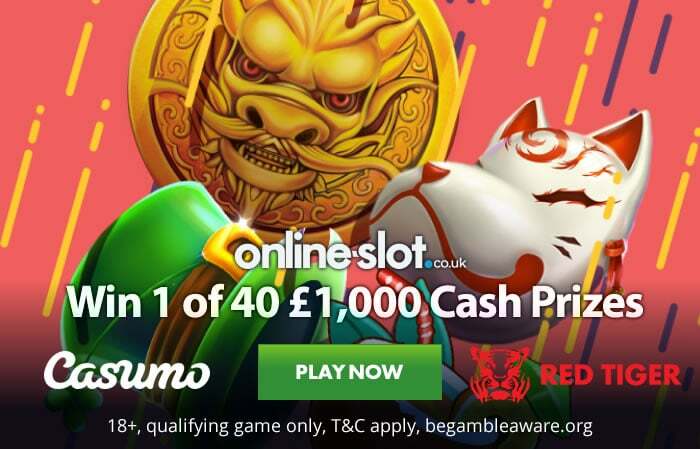 Every week between now and the 28th of April (2019), Casumo Casino will be awarding 10 raffle prizes worth £1,000 apiece to players spinning on a special selection of slots from Red Tiger Gaming. To take part, all you need to do is log in at Casumo, head on over to the Promotions page then get playing on that’s week’s qualifying Red Tiger Gaming slots. Each time you play one of the eligible slots, you’ll receive a ticket into the special prize draw where 10 lucky winners will each grab a grand. Here’s the list of each week’s qualifying slots and the dates you need to play them. The 4 weekly draws follow on the 8th, 15th, 22nd and 29th of April respectively. Our pick of the qualifying slots for the week 1 draw is Esqueleto Mariachi. Based on the Day of the Dead celebrations, this colourful Mexican-themed slot comes with some cracking extras. The stars of this performance are the trio of skeleton mariachi musicians who deliver a trio of modifier extras. The Guitarrista brings extra wilds into play, the Trompetista blasts symbols from the reels and adds new ones to hopefully create a new winning combination while the Maraquero delivers nudges. Trigger the free spins bonus round and the 3 mariachi extras are in play on each of them. Boasting superb visuals and a classy backing track, Esqueleto Mariachi is a top take on a classic theme. Take it for a spin this week and it could get you a £1,000 boost thanks to Casumo Casino. New players at Casumo are eligible for a bumper welcome package. On offer is a 100% bonus worth up to £300 as well as 20 no deposit free spins.